Paper artist and designer agrees to join Highcon's advisory board. 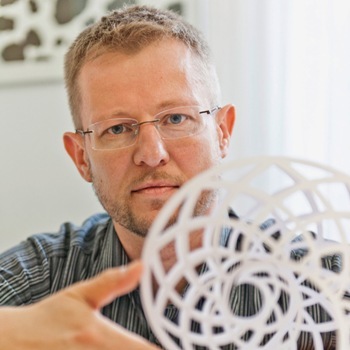 Peter Dahmen, Paper Artist Extraordinaire, joins Highcon Advisory BoardHighcon has announced that Peter Dahmen, designer and paper artist, has agreed to join Benny Landa, Zev Weiss and Mike Ferrari on Highcon's Advisory Board. He is well known as a passionate advocate of stretching the boundaries of the possible when it comes to anything paper or board, and has been collaborating with Highcon on numerous pop-ups and designs that have been showcased at tradeshows and events. One of the highlights of Highcon's recent appearance at Print China was a crystal/flower pop-up which Dahmen created, and promises to be the first of many. "Peter's passion for paper, combined with the digital capabilities of the HighconTM Euclid, has resulted in extreme designs that totally prove the potential of our digital cutting and creasing technology," said Aviv Ratzman, Highcon CEO & Co-founder. "Together we will push the boundaries of paper design from 2D to 3D into completely new realms. Highcon's digital finishing solution removes the limitations that have restricted packaging design and enables a wide range of new applications." Dahmen is just as excited about this new collaboration: "I'm mainly interested in exploring what is technically possible. I'm looking for complexity in series and structures. 3D is big in the movies, in electronic media and in books but computers aren't bound by physical limitations. Paper is, and people often underestimate the amount of work that it involves. The Euclid has given me the ability to produce highly intricate and effective pop-ups and designs efficiently and cost-effectively." He is a social media celebrity with millions of viewers of his YouTube, Facebook and Pinterest pages. Working as a freelancer, he has produced amazing designs for major brand owners, including what is probably the largest pop-up ever in the world, for the press launch of the new MINI car (BMW Mini cooper) in 2011. It was 10.5 meters wide and more than five meters high. He has received commissions from companies worldwide. In addition to collaborating with card manufacturing companies, Dahmen has designed amazing pop-up sculptures for the American magician Marco Tempest. If you would like to receive updates about Peter’s work with Highcon, please click here. You can Tweet, Like us on Facebook, Share, Google+, Pinit, print and email from the top of this article. Copyright © 2015, DPNLIVE – All Rights Reserved.